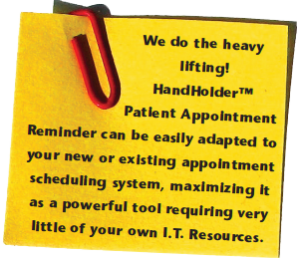 HandHolder™ is a unique patent pending product that is impacting patients and healthcare organizations across the country. It is perfect for healthcare providers bogged down with regulations and serious time pressures. It is increasingly important that patients understand what they are expected to do and what they can expect in return from their caregivers. The shift from fee for service to pay for performance is a cataclysmic change culturally, financially and fundamentally. 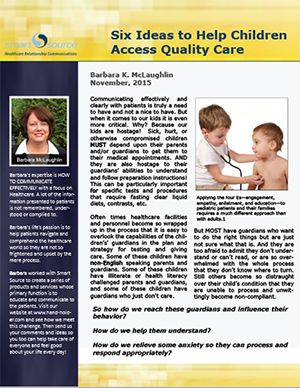 Increasingly patients are expecting their healthcare providers to do much more than treat them. 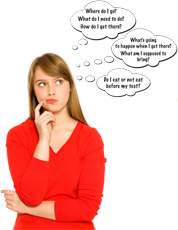 They want to understand and be true partners in their own health. Without true, consistent and clear communication this is just not attainable. Engagement strategies must be re-evaluated. To reach a diverse patient population it is critical that we engage patients using multi-channel processes. HandHolder™ from Smart Source will integrate your communications and deliver personalized information to your patients using all methodologies of delivery to maximize patient contacts and comprehension.Research has shown that diverse patients require diverse communication solutions in order to be fully engaged in their healthcare and satisfied with their care experience. Whatever the medium—no one can help you communicate the right information to your patients better than Smart Source Healthcare Relationship Communications experts. Are you a Children’s Hospital? Properly prepared for their visit/procedure.